Tammy kept losing jobs—at the checkout counter, as a hospital cleaner, and now with the before-and-after-school program. But what worried her most was Sam, her youngest. From the time he was very young it had been clear that something was wrong with Sam, seriously wrong. And though they didn’t often speak of it, the whole family could certainly see it. “He’s pathetic,” Sam’s sister Letitia would sneer to her friends, “pathetic.” Tammy never felt that way herself, not for a moment. But what was she to do?—that was the question. Animals follows Sam on the extraordinary odyssey that begins with Tammy’s decision. Central to the narrative of his progress are the Stinson family—above all Naomi Stinson, a young girl who develops a special feeling for the strange creature, Sam. Animals is set in an indeterminate future in which virtually all the species that humans have for millennia used as food have become extinct; the world it creates is at once eerily foreign and disturbingly familiar. 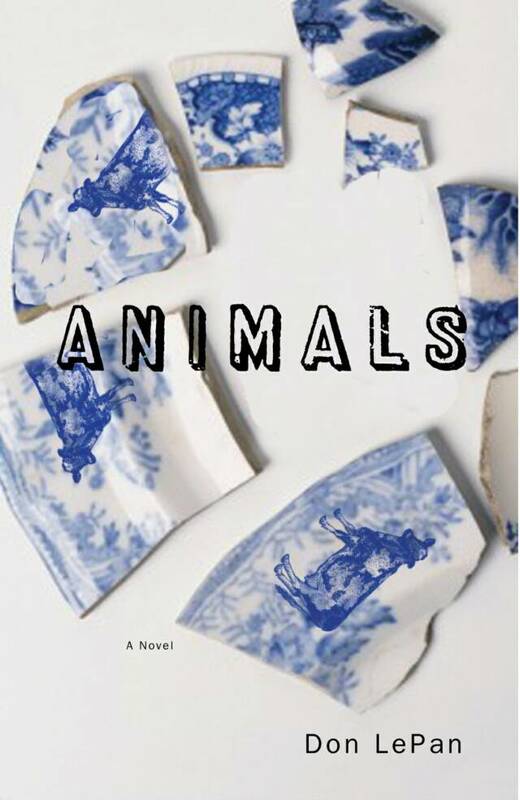 In the sharp-edged ethical questions it poses, in the narrative techniques it employs, and in the story itself, Animals is a highly unusual novel. The author: Don LePan has spent most of his adult life working as a book publisher; he is the founder and president of the academic publishing house Broadview Press. He has also worked as a taxi driver in Toronto, a hospital cleaner in Lewes, England, and a teacher in rural Zimbabwe. He holds a BA from Carleton University, an MA from Sussex University and was awarded an honorary doctorate by Trent University in 2004 for his contribution to academic publishing. His other books include a study of Shakespeare’s plots and of cognitive history, an overview of common errors in English, and a monograph on Tennyson’s war poetry; this is his first book of fiction. He has for many years painted large skyscrapers and baseball stadiums; his first solo exhibition was held in Brooklyn in 2008. Born in Washington, DC and raised in Ontario, he lived has lived for most of the past fifteen years in Calgary, Alberta; in August 2009 he relocated to Nanaimo, British Columbia. In recent years he has also lived in New Orleans, Louisiana. Animals: A Novel is now available at many bookshops throughout North America. Canada. Orders may also be placed through the Véhicule Press or Soft Skull Press websites, through other online retailers, or through your local retailer. The distributor for Véhicule is LitDistCo in Georgetown, Ontario (orders@litdistco.ca); the distributor for Soft Skull/Counterpoint is Publishers Group West. Promotional queries should be directed to marketing@vehiculepress.com (Canada) or sarah.cantor@counterpointpress.com (USA). The author may be contacted at don.lepan@broadviewpress.com; his blog may be found at http://donlepan.blogspot.com. As soon as its lips moved she knew it was a mongrel. She heard the gurgle where proper words should be. And she knew she wanted to keep it, wanted to hold it and make it warm, wanted to make it her special friend. Her Mummy and Daddy had told her she couldn’t have a mongrel, mongrels were too much trouble, she’d get tired of it, in the end half of them had to be sent to the Repositories anyway, in the end people who kept mongrels got tired of them, that was just a fact, half the time or even more than half the time it didn’t work out. But Naomi knew it wouldn’t be like that with her, not with a little one that was hers—one like this one that was a little creature and also a good creature. Mummy and Daddy had told her she could sometimes know inside herself if someone else had a good heart or a not so good one, and it was true, she could, she knew Mr. Carruthers at the corner store was a bad person no matter what anyone said, he did things with his hands behind the counter that made you want to run away before you had paid for your candy, and Ms. Riis at the library, rhymes with fleece, she would always say, not rice, not nice, but she was nice, she was good, you could know that.